- Extremely long service life. - Outstanding cutting performance in all metals. - Ideal for serial drilling jobs and continuous use. - High cutting speed possible. - Particularly cost-effective in the workshop in industry and manual trades. Tough jobs need tough tools. 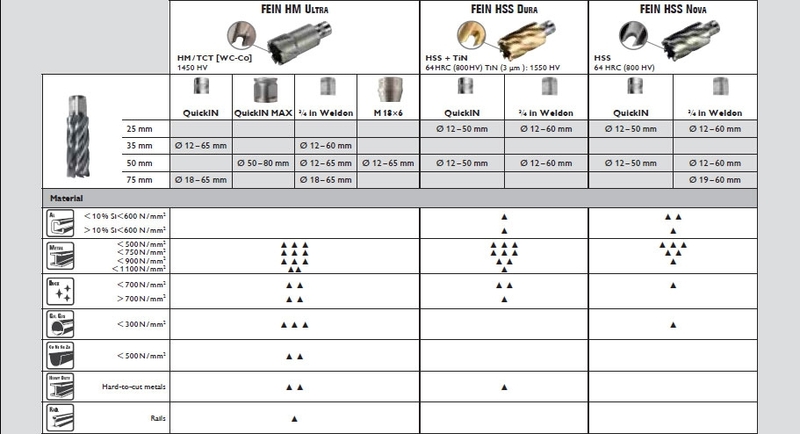 No matter what your material or application, whether your diameter is 80 mm or your cutting depth is 75 mm – FEIN's extensive range of core drill bits will have the right tool for your job. - HM Ultra: Durable and powerful in all metals. - HSS Dura: TiN coating, perfect for steel and stainless steel. - HSS Nova: Resistant to shock and impact in steel construction and on the construction site.